Toyota Company of Australia has introduced the most exclusive and fuel-efficient locally built Hybrid Camry car. This Toyota product is manufactured with the combination of around 140KW power from its 2.4 liter petrol engine and electronic drive motor. It is expected that this product will use at least 35% less fuel than the locally built six-cylinder cars. Toyota Australia company has introduced the most significant Hybrid car in order to change the Australian Automotive landscape, and also offer Australian motorists with an inexpensive and environmentally responsible vehicle. All the Hybrid vehicles are producing lower and cleaner productions than the standard engine technologies that diminish fuel consumption and also lessen the demand for oil. Toyota Industry Company is planning to build total ten thousand (10,000) vehicles in only one year for the domestic market. It also produces 300 more vehicles to export in New Zealand from Australia. 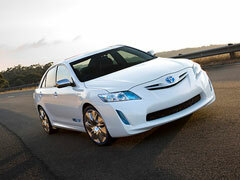 Toyota will release its exclusive version of Hybrid Camry car to the market in February 2010. This product has many different advantages, but the most and most demanding advantage of this vehicle is that it is fuel-efficient. This Toyota Hybrid Camry car is currently manufacturing in different countries of the world instead of Australia. This vehicle is available in Thailand, Japan and United States of America. The fuel saving data of this Hybrid Camry is based on ADR 81/02 combined cycle. It consumes very low fuel as compared to the other vehicles, but its fuel consumption depends on your driving styles and conditions.